Few authors' names conjure up such an air of ghoulish terror as that of Edgar Allan Poe. 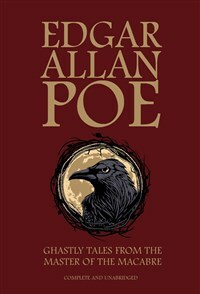 The best of his chilling horror stories and other suspenseful tales, 27 short stories in total, are presented here in one fantastic volume, providing an ideal introduction to this master of the macabre for those unfamiliar with Poe's work, or a welcome return to Poe's dark and mysterious world for committed enthusiasts. Although best known for his classic gothic horror tales such as The Pit and the Pendulum, The Fall of the House of Usher or The Premature Burial, he also wrote mystery thrillers like The Murders in the Rue Morgue or The Mystery of Marie Roget and curious stories like The System of Doctor Tarr and Professor Fether. Edgar Allan Poe was born in Boston, Massachusetts, in 1809, the son of an actress and an actor. His father left home when he was only a year old and his mother died shortly afterwards, leaving Poe to be adopted by a wealthy Scottish merchant in Richmond, Virginia, named John Allan, from whom Poe took his middle name. Poe dropped out of University and enlisted in the Army, eventually attending West Point and becoming an officer. He then managed to get himself courtmartialed, leaving the army to pursue a writing career in 1831.